Using a purple face painting stick, draw pointed eyebrows over the eyes onto forehead. Paint the lips. 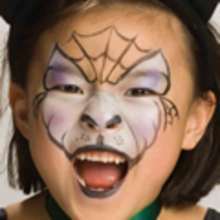 Using a white face painting stick, draw 2 dots on the cheek to be spider's eyes. Then with a black face paitng stick, draw on the shape of a spider, adding 2 tiny dots inside the eyes. Add a beauty spot on one side of the nose. Using an orange face painting stick, draw a pumpkin on the right cheek. Then with a green face painting stick, add a stalk on the pumkin and draw a spider's web on the forehead. You are a girly halloween witch now! Meet your Halloween friends, do not forget your basket and go for sweets! 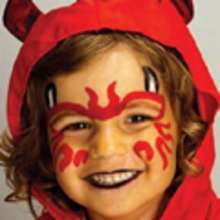 Snazaroo is a safe face and body paint. Professional and cosmetic quality. A quality product easy-on with sponges and brushes. Easy-off with soap and water.